We should often reflect on the third commandment and the significance it held in the life of Padre Pio. 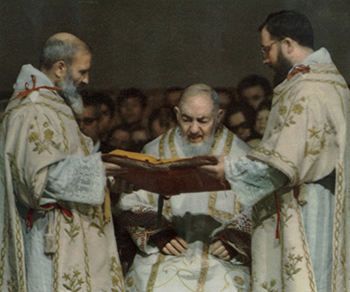 Padre Pio not only kept holy the Sabbath day, but every day of his life, by consecrating each day entirely to the Lord. From early childhood, Padre Pio felt strongly attracted by all aspects of the spiritual life. As soon as he heard the bells ringing, he showed a great desire to go to church. He stopped playing and left whatever he was doing, saying, “I must go to church with Granny.” As a child he heard Mass every morning before going to school and every evening he went to Benediction. He always tried to bring a companion. Every Sunday he diligently attended religious instruction at his parish. He learned the ten commandments and the importance of the third, “Remember to keep holy the Sabbath day,” had not escaped his attention. One could relate many more anecdotes that show how Padre Pio observed and made others observe the third commandment. In the same way that he celebrated and lived the holy Mass, he wanted his spiritual children to participate at the holy Sacrifice without superficiality or distraction. His knowledge of the inestimable and immense value of the Eucharistic offering made him give detailed counsel on the way of keeping the Lord’s day holy. “In order to avoid irreverance and imperfections in the house of God, in church, which the Divine Master calls the house of prayer, I exhort you in the Lord to practice the following: Enter the church in silence and with great respect. Among other pious considerations, remember that our soul is the temple of God and, as such, we must keep it pure and spotless before God and His angels. Then take holy water and make the sign of the cross carefully and slowly. As soon as you are before God in the Blessed Sacrament, devoutly genuflect. Once you have found your place, kneel down and render the tribute of your devotion to Jesus in the Blessed Sacrament. Confide all your needs to Him along with those of others. Speak to him with filial abandonment, give free rein to your heart and give Him complete freedom to work in you as He thinks best. When assisting at Holy Mass be very composed when standing up, kneeling down and sitting, and carry out every religous act with the greatest devotion. Be modest in your glances; don’t turn your head here and there to see who enters and leaves. Don’t laugh, out of reverence for this holy place and also out of respect for those who are near you. Try not to speak to anybody, except when charity or strict necessity requires this. On leaving the church, you should be recollected and calm. First, take your leave of Jesus in the Blessed Sacrament. Do not leave Him without asking for and having received His paternal blessing. Once you are outside the church, be as every follower of the Nazarene should be. Above all, be extremely modest in everything, as this is the virtue which, more than any other, reveals the affections of the heart. You must be modest in speech, modest in laughter, modest in your bearing, modest in walking. Therefore, be humble of heart, circumspect in words, prudent in your resolutions. Always be sparing in your speech, attentive in your work, modest in your conversation. Always keep before your mind the Divine Master’s meekness which according to the expression of the Apostle to the Corinthians, is on a par with His gentleness. “I, Paul, exhort you, by the gentleness and meekness of Christ…” After so perfect a model, change all your external actions so that they are a faithful mirror revealing your interior sentiments. Never forget this Divine Model, Annita. Try to see a certain lovable majesty in His presence, a certain pleasant authority in His manner of speaking, a certain sweet serenity in His face. Imagine that extremely composed and sweet expression with which He drew the crowds, making them leave cities and castles, leading them to the mountains, the forests, to the solitude and to deserted beaches, totally forgetting food, drink and their domestic duties.